Please note: You must be on the Full Suite or Pro plan to get the SuiteFiles Outlook add-in. Click Download under SuiteFiles for Outlook. The file will start downloading automatically. 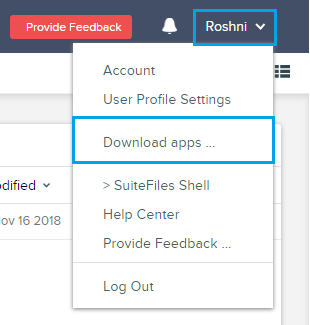 Login to your SuiteFiles account using your SuiteFiles URL, Office 365 user name and password. If you have two factor authentication enabled for your Office 365 login, you will need to create an Office 365 App password and use this in the Password field. Instructions on how to create this app password can be found here. SuiteFiles Outlook only works in Outlook 2013 and Outlook 2016 running Windows. Microsoft's .net framework 4.6.2 or higher needs to be installed for the app to work successfully.